Cartoon Network has a reputation for promoting crap at the expense of good cartoons. Just look at Scooby Doo Mystery Inc., Thundercats and Young Justice, where episodes would get one airing and no repeats; but hey, you can catch hours and hours of Johnny Test every damn afternoon! You like that, right? One property that CN does appear to be treating well is Ben 10. Now in its fourth incarnation, Ben 10 is a series created by four comicbook guys and deals with a kid (Ben) who has a magic outer space bracelet (the Omnitrix) that allows him to turn into a limited number of crazy space aliens (57). It's all very toyetic, which is probably its saving grace - literally. Cartoon Network cancels anything that doesn't have sufficient merchandising potential. 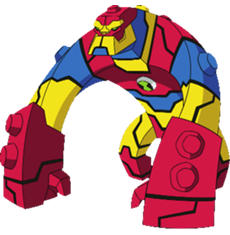 Bloxx is a Segmentasapien from the planet Polyominus. But more importantly, he's a gorilla made out of Legos. That's all you need to know. That's all I needed to know, at least. The art director for the newest incarnation of Ben 10 is Derrick J. Wyatt, known for his giant chins - Bruce Campbell style chin, not Bruce Vilanch - and that's definitely in evidence here. That's the biggest chin we've seen since Transformers Animated! 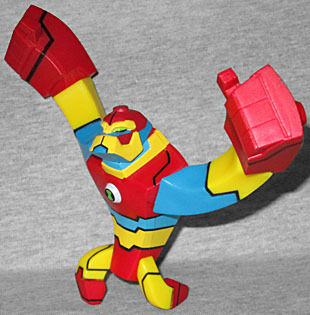 This figure is based very emphatically upon the model sheet for Bloxx, right down to the specific pose (yes, the figure is articulated, but we're talking about the "at rest" pose). 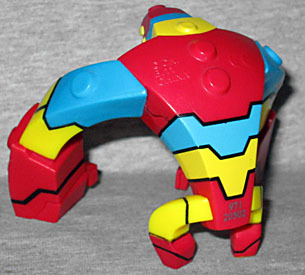 Actually, he's not that articulated: he moves at the hips, wrists, shoulders and neck, and all seven joints are plain swivels. Considering that the character's powers include shapeshifting, that's really not a sufficient amount. "Shapehifting" doesn't adequately describe what he does: it's more like "total molecular control," since he can not only form whatever shape he wants (and whatever size he wants), but can also reconstitute his body if it gets blown up. 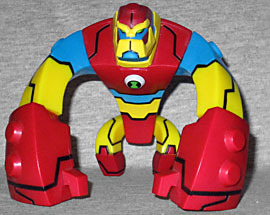 Why, it's almost like he's made from a bunch of tiny bricks that all snap together to build anything at all! That's just in the fiction, of course: the toy is more solid than that. The lines are curved but clearly geometric, not organic. There are studs on the back of his hands, on top of his shoulders and head, and down his spine, hinting at his Lego-y origins. Ben's Omnimatrix is in the center of his chest. Bloxx is colored vibrant hues of red, yellow, and black, with black outlines separating the sections. Since this is Bandai, there are some sections that are sculpted but not painted. Gotta cut those corners! On the plus side, since we're just talking about plain black lines (and they're already molded into the plastic), it wouldn't be too hard to color them in yourself. Like we said above, Cartoon Network cancels any show that doesn't have toys. Genndy Tartakovsky's Sym-Bionic Titan was really improving as it went along, but because no one was making toys based on it, CN shuffled it into a dead timeslot and torpedoed the show. And we already told you what happened to Young Justice. Ben 10 has been getting toys since the very beginning, and so it keeps getting renewed and rebooted. This is the first time I've ever bought one of the figures, and then only because it was a toy that looked like a different toy. Can't help but wish it was better, though.